« Art Exhibitions on a Narrowboat? One family is currently moored at Bradford on Avon, Wiltshire, on the Kennet and Avon Canal. It’s a picturesque town they know well, and it’s where one child goes to a local school and another to nursery. And that’s the problem. Like most of the 32,000 canal boats (more than during the Industrial Revolution) their boat is licensed as a “continuous cruiser”, without a home mooring – which can be very hard to come by. “We didn’t choose to live on boats because it’s an easy lifestyle. We chose to live on boats because we love the canal,” says Powles. Ted and Jassy’s 70ft canal boat “Pathfinder” was built in 1893. You can listen to Andrew Bomford’s report on Broadcasting House, BBC Radio 4 on Sunday 17 April at 09:00 or catch up afterwards on the iPlayer. Under the British Waterways Act 1995 such boats must be used – in the words of the legislation – “bone fide for navigation… without remaining continuously in any one place for more than 14 days or such longer period as is reasonable in the circumstances”. The Canal and Rivers Trust (CRT), which took over control of the 2,000-mile English and Welsh canal network in 2012 from the old British Waterways, takes it to mean that boaters must be on a continuous journey, mostly in one direction, from one place to another. According to CRT they must travel at least 15-20 miles a year, and usually much further. 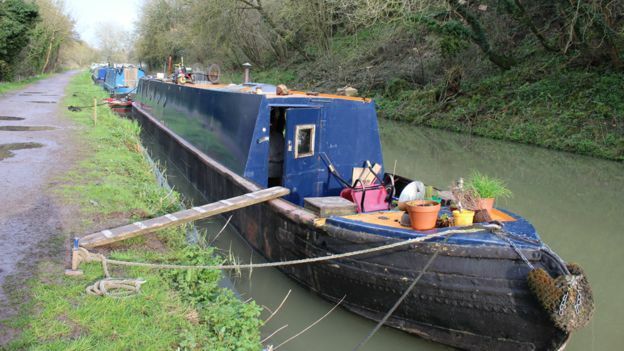 At the time of writing the Canal and Rivers Trust is currently carrying out enforcement proceedings against 45 boat owners who have been refused further licences because of repeated failures to travel sufficiently. According to CRT, it is currently instructing solicitors to seek court orders to seize the boats in 15 cases. Two canal boats have already been removed from the water and destroyed.